Margao, A riverine city & second largest town in Goa is the principal commercial center. It is 33 Kms. from Panaji. Its green paddy fields and low rolling hills is what defines Margao much better With the shaded streets are lined with graceful colonial mansions and churches, its colourful markets are full of the Goan products, with some items not found anywhere else. Margao is an ideal base from which you can venture forth into rural Salcete and other towns of Goa.The capital of Salcete province, Margao is a commercial and industrial centre of the Southern Goa. Margao was prosperous settlement even before the arrival of the Portuguese and it was an important centre for trade, learning and religious activities. The town was founded in the Portuguese pattern along the sweeping curves, around the Holy Spirit Church. Today the new buildings have mushroomed everywhere but this pleasant provincial town still displays many reminders of its Portuguese past. Situated at the heart of Margao, the Town Square is a perfect place to enjoy natural beauty. To find a heaven of peace visit the two gardens - Municipal Garden and Aga Khan Park, which are separated by a walkway. The Municipal Garden is in front of the Municipality building and the Agha Khan Park is located towards the Post Office. A Statue of Luis de Menezes Bragance stands at the Municipal end of the Municipality Garden. Apart from housing the council, the Municipal Building has a well-stocked Public Library, with books in various languages like Hindi, English, Marathi, Konkani and Portuguese. The Library timings are 9 am to 1 pm and 3 pm to 6.30 pm and the reading hall of the library is open from 8 am to 8 pm. The Church Square or Largo da Igreja is the most attractive part of Margao and one of its two tourist hotspots. Church Square is a Latin Quarter with many magnificent colonial buildings. The Church of the Holy Spirit is the major attraction of Church Square. Initially built by the Jesuits in 1564, the church was very soon destroyed by Adil Shah's army in 1571. Makeshift repairs were carried out much later in 1645 and completed by 1675. A fine example of Indian Baroque, the Church of the Holy Spirit has a beautiful dome and towers on either side. Its interior is worth seeing, especially the altars and the exterior is also a feast for the eyes. In the vicinity of this church there are several gracious old houses, famous among them is Sat Burnzam Ghor, the ancestral home of Eurico da Silva. Earlier a seven gabled house, da Silva's Sat Burnzam Ghor has only three houses now. If you like a spectacular view then follow the road from Largo da Igreja to reach the top of Monte Hill. From the courtyard of the Monte Chapel, you can take the magnificent view of the Salcete countryside. Monte Hill can be reached by motorcycle taxi. The Grace Church is a modern structure situated on Varde Valaulikar Road. The most interesting feature of this church is the rare crucifix of the resurrected Jesus Christ. The statue is drapped in a shroud, with arms outstretched towards the congregation, and the crown of thorn is absent. The timings of the church are 7 am to 10 am and 4 pm to 7 pm. Locally known as Pandava Chapel, this Chapel has recently been given the status of a church. St. Sebastian Chapel was named as Pandava Chapel because a group of ancient caves were located behind this. These ancient caves are now heritage monuments protected by the Archaeological Survey of India (ASI). Timings of the Chapel are 9.30 am to 1 pm and 4.30 pm to 6 pm. Hari Mandir and Damodar Temple are the two popular temples of Margao. These temples are not separate structures, actually they are rooms in two individual houses. The Damodar Temple also known as Damodar Sal, is housed in the Naik Family Residence on Abade Faria Road. Damodar Temple is renowned as the place where Swami Vivekananda stayed before his departure to Chicago to attend the Parliament of Religions. The Hari Mandir is located on Martires Dias Road and occupies a single rooms at one end of the office building. Other notable temples are a small modern Ram Nandir and the Vithal Temple at Comba Ward. Just 8 kms from Margao, the Rachol Seminary is perched atop a picturesque hillock. The Rachol Seminary trains young Goan men for the priesthood. The history says that the Portuguese originally built this as a Church in 1521, and later it was converted into a fortress and prison. In 1609, Portugal King Sebastian ordered the establishment of monastery to train Goan Jeuist priests for spreading Christianity. However, the history of Rachol Seminary goes before the advent of Portuguese. Excavations reveal that there was Shaivite Temple initially which was replaced by a Muslim Fort that later fell to the Portuguese. You can see the remains of the fort in the form of a gate and moat. Loutolim is located at a distance of 10 kms from Margao. The home of cartoonist Mario Miranda's mansion is the prime attraction of this place. Apart from Mario Miranga's mansion, the traditional Goan country mansions and Ancestral Goa are other major attraction. Loutolim is an open-air museum that depicts the Goan life centuries ago. At Loutolim Maendra Alvares, the curator/ creator, has made several life-sized figures and stone sculpture of Goan fisherfolk. The highlights of Ancestral Goa is the stone sculpture of Sant Mirabai and a restaurant serving exotic Goan cuisine. The markets of Margao mostly offer agricultural products. In addition to agricultural products you can buy fruit and vegetables, wines, baked goods, cloths, hardware or appliances or pots and pans. If you are not interested in shopping just stroll around and enjoy a quietly festive atmosphere. Margao is the commercial hub of Goa so the hotels in the city are more functional than posh. Most of the hotels in Margao are conveniently located close to the railway station. Other Hotels : Hotel La Flor, Hotel Paulino, Hotel Red Roof, Hotel Saaj, Margao Residency, Sincro Hotel. By Air : Dabolim airport is the nearest airport, which is 30 kms away from Margao. 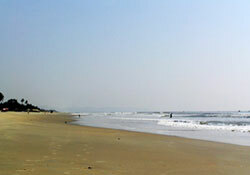 Flights of Indian airlines as well as private airlines are available to Dabolim from major cities of India. Margao is well-served by KTC shuttle buses. By Bus : Margao is situated on National Highway 17 at a distance of 33 kms from Panaji and 626 kms from Mumbai. From Margao, luxury buses run to Panaji, Colva and other places of Goa on hourly buses. Local Trasport :Motorbikes are quickest and the most preferred mode of local transport. You can pick up motorbikes on rent outside the bus stand to visit the beaches around Margao.